We spent two hours with Banjo-Kazooie's replacements, and came away both impressed and nostalgic for '90s mascot platformers. I knew Yooka-Laylee was inspired by Banjo-Kazooie, but until I played it last week I’d underestimated the extent. It’s uncanny. You know how some people are convinced the Berenstain Bears used to be known as the Berenstein Bears, except we all fell into a parallel universe and somehow the past has changed? Or that Oscar Mayer is spelled Oscar Meyer? The “Mandela Effect,” the internet calls this phenomenon. 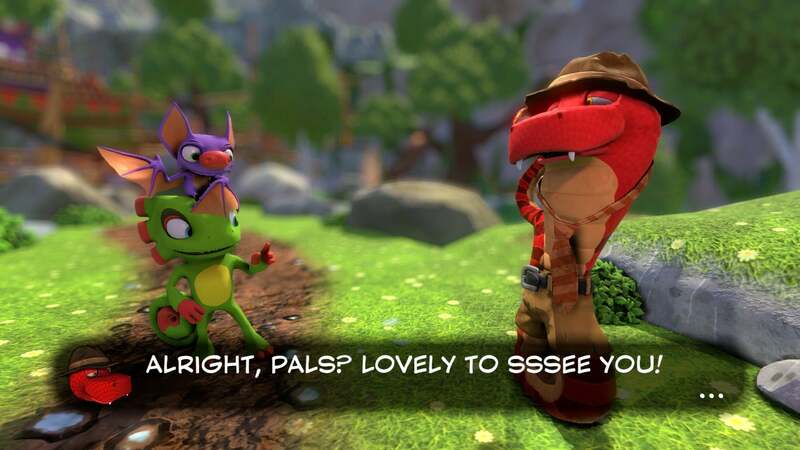 Well, in some parallel universe “Banjo-Kazooie,” the Nintendo 64 classic about a bear and the bird who rides in his backpack, was actually Yooka-Laylee, the very similar story of a chameleon and his bat-friend. And then I guess in 2015 someone from our universe fell into that other world, stole a Yooka-Laylee cartridge, and brought it back here. And not just because of the core mechanics. Sure, those are related. This is a collectathon-type platformer, absolutely familiar to anyone who played Banjo-Kazooie or Donkey Kong 64 or any of the games of that era. 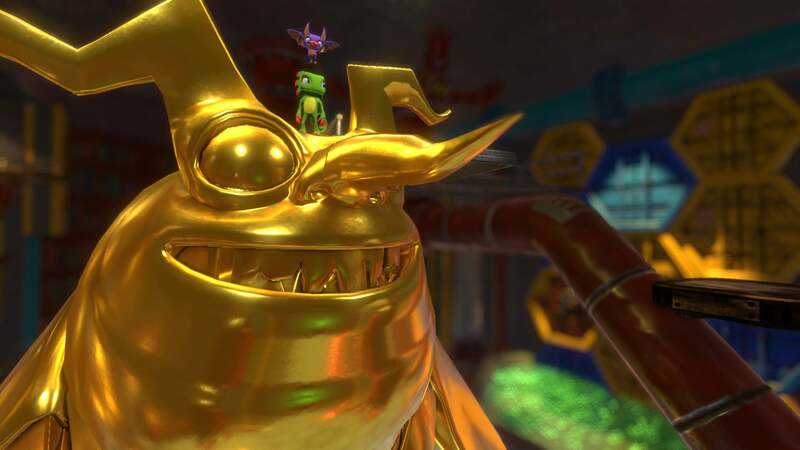 Yooka-Laylee’s levels are larger and the MacGuffins in question are “Quills” and “Pagies”—the villain has stolen all of the books from Yooka-Laylee’s world, and it’s your job to steal them back—instead of “Puzzle Pieces” and “Honeycombs,” but the moment-to-moment is still about running around an open-ended area, bashing the occasional enemy, and picking up X number of objects along the way. Other games have done that though, and done it well. (See: Unbox.) 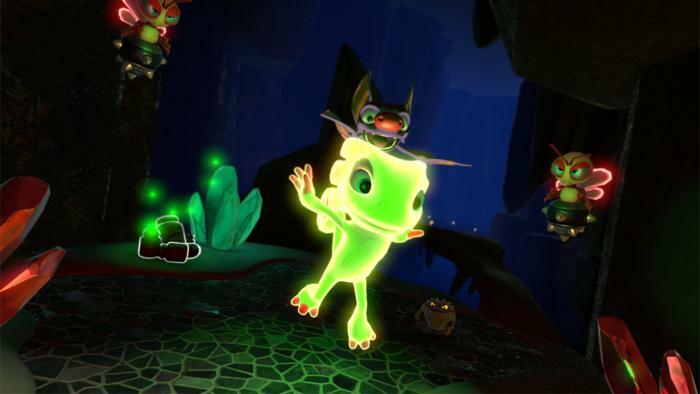 What sets Yooka-Laylee apart is a slavish adherence to ‘90s design, mimicking Banjo-Kazooie on a much deeper level than most modern homages. Scene transitions, for instance. Banjo-Kazooie’s scene transitions were, I guess, “Puzzle Piece Wipes,” where a silhouette of a puzzle piece would shrink and close out the old, then bloom back out to reveal the new location. Yooka-Laylee does the same except with a somewhat more elaborate silhouette of Yooka and Laylee. And nobody speaks. Instead, dialogue is handled the same way as Banjo-Kazooie: Whether villain or hero, all you hear is a series random monosyllabic grunts, while the actual text is spooled out one character at a time in a black box. Then there’s the look and feel, of course. Bright, almost super-saturated colors. Bizarre cartoon architecture designed strictly for platforming, not some semblance of realism. Upbeat, repetitive music. Late in my demo I discovered a throwaway joke involving Shovel Knight, and as far as random crossover gags go it’s weirdly appropriate. Shovel Knight is a great game in its own right, but doubly so because it tried to work within the constraints of the actual Nintendo Entertainment System—colors, controls, everything was designed so that it felt like it could possibly, in some other dimension, have been an actual NES release, circa 1987. The same with Yooka-Laylee. This is much more than a “Banjo-Kazooie style platformer.” It is Banjo-Kazooie, just with more polygons and 20-odd years of additional design knowledge. But this is only maybe a third of the Tribalstack Tropics. Once you’ve “finished” the level and exited, you’re told that you can either move on to the next area (Glitterglaze Glacier) by leaving and finding its entrance or, for completionists, you can “Expand” the Tribalstack Tropics (cleverly represented by adding more pages to the hardcover book within which the level exists). Expand, re-enter, and Tribalstack Tropics will be completely different. Or rather, the core area will be the same, but now there’s a whole new temple off to the side, and another off in the distance stretching hundreds of feet in the air. The level has tripled in size, adding more challenging platforming sections and a host of new collectables. 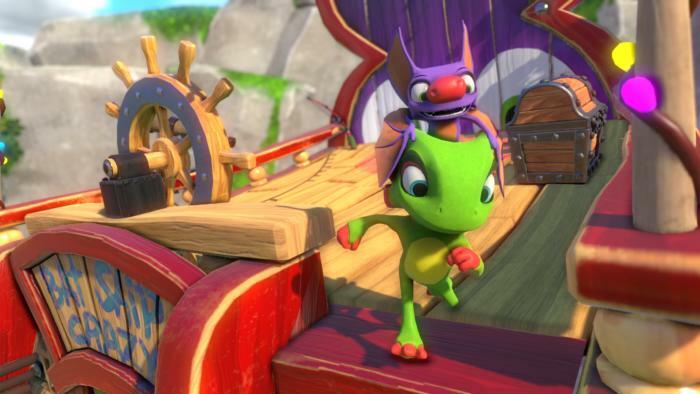 It feels almost like you’ve got two games in one—Yooka-Laylee and Yooka-Laylee: Remastered or Anniversary Edition or what-have-you. It’s simultaneously the Yooka-Laylee I might’ve expected in 1997 and the one I’d expect now, in 2017. It’s a fascinating contrast, and one I look forward to exploring further during our actual review. And I am looking forward to our eventual review, more now than ever. There’s definitely a novelty aspect to Yooka-Laylee. It’s Banjo-Kazooie! Except not! With this style of game largely gone from the collective conscious, two hours with a mascot platformer is both an excellent pastime and a wondrous dose of nostalgia. 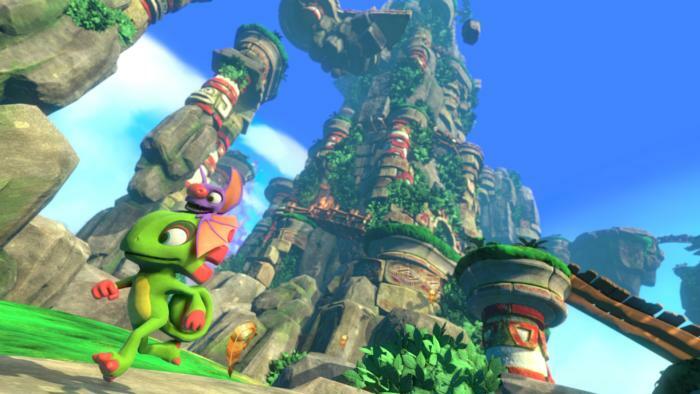 Whether nostalgia alone is enough to get people through 10 to 15 hours of Yooka-Laylee? That’s a more difficult question to answer.